We provide state of the art facilities in our campus. We have ensured that the most modern lab facilities are available to our students. 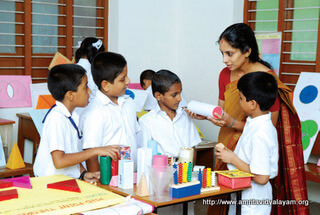 Computer Education initiates our young students into the captivating world of computing, and introduces them to its wide and ever increasing range of applications. We commence computer education from lower classes itself. We make sure that high end machines are available for each child. Our computer lab is spacious with the latest computers. 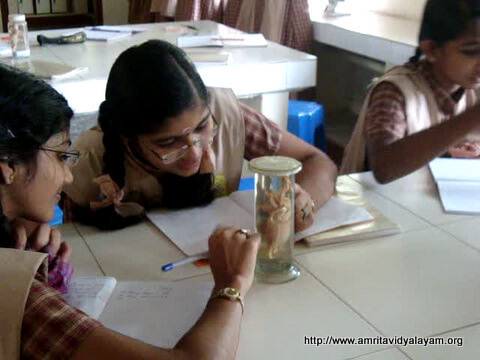 Our Amrita Vidyalayam has well equipped science labs, and we focus mainly on hands-on practical work so that students may get a better insight into scientific theories. This enhances the inherent inquisitiveness of the student and energizes him to examine uncharted paths. We have one spacious composite science lab with the most modern scientific equipment and teaching aids which reflect the high standard of education set by us. Our Math lab, a fresh concept in the educational field, helps students to understand mathematical principles through exercises, models and teaching aids. 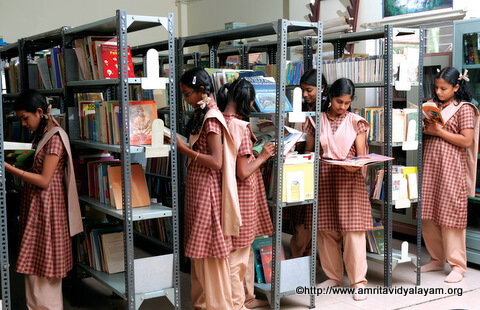 Our library occupies a spacious room with a large collection of books on a wide variety of topics. Books on spirituality, foreign publications, Encyclopaedias, literary work in English and Kannada, etc. are available. In addition to this, we also have rare reference books that help to enhance the knowledge of the students. Our school promotes reading, and encourages students to cultivate a reading habit which in turn can help them to augment their knowledge and language skills. Physical fitness is the basis of dynamic and creative intellectual activity. Sports provide an excellent opportunity for our students to stay fit and develop team spirit and friendship among other things. The school has taken great care to ensure that all sports requirements are met and our children are benefited by the same. 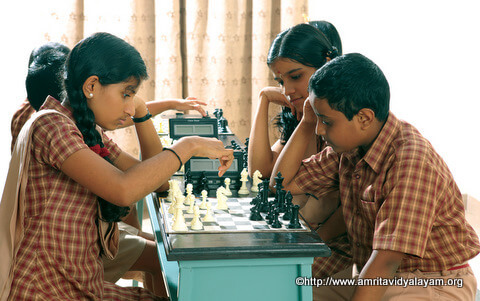 We have one room for sports related activities and have provision for indoor games such as carrom, chess and badminton. Ample facilities for outdoor games such as volley ball, hand ball and kho – kho are available, since we have the respective playgrounds. In addition to this, we have a 200 metres track and a long jump pit to promote athletics. Our school has outsourced transportation to a third party on contract basis, connecting the school with various selected locations across the town and its outskirts. In addition, we have 7 other vehicles for different purposes. Our school building has 1 room each for the Principal, H.M., staff, and office. We have 27 class rooms, 1 composite science lab, 1 math lab, 1 library, 1 computer lab, 1 e-learning lab, 1 examination room, 1 work experience room, 1 drawing room, 1 resting room, 1 sports room, 1 TV room, 1 music room, and 1 conference room. Ample facilities are available for conducting cultural and other programmes as we have a spacious hall to host such functions. We achieved 100% pass in the recent AISSE examinations conducted by the CBSE Board. Our students have also participated in various competitions and won laurels. The school has panchayat water supply and well, ensuring availability of pure water. We have uninterrupted power supply with UPS backup for office and computer lab. The best, hygienic and separate sanitation facilities are available for girls and boys. First aid is available in the campus itself and higher medical facilities are available nearby. Our students are exposed to the ancient and vibrant culture of Bharat, which helps to inculcate moral and social values in them. Daily chanting of the Bhagavad Gita and other slokas, in addition to moral lessons and stories, instil values of kindness, mercy, patriotism and respect for parents in the students. 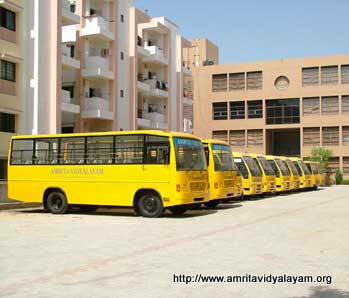 The nearest KSRTC bus station is just 7 km from the school and Shirwad Railway Station is 20 km away. The nearest airport is the Dabolim Airport in Goa, approximately 75 km from here.